The school emphasizes on interactive sessions where the child is encouraged to express freely because we believe that discussions & interactions make the learning more effective. The students are assisted,guided & encouraged by their teachers who become true facilitators in all respects. The school also organizes various co-scholastic activities like the book fairs, exhibitions in science and other subjects, sports day, annual social gathering. All the students are motivated to perform and also enjoy the activities. The school also organizes various co-scholastic activities like the book fairs, exhibitions in science and other subjects, sports day, annual social gathering. All the students are motivated to perform and also enjoy the activities. 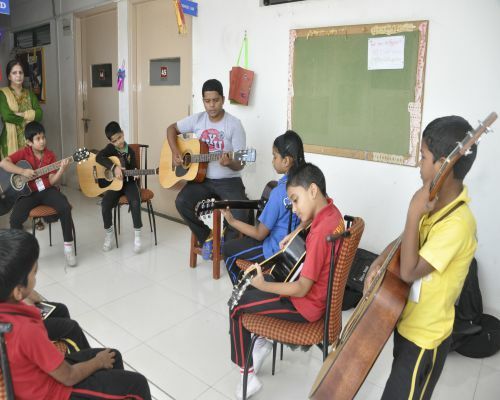 The inner and hidden talents of our students get well demonstrated and exhibited in various programs that are conducted throughout the year by the school. The School encourages the children to do COMMUNITY SERVICE for the under privileged.To inculcate the moral values, attitudes and skills in our children they are introduced to SCHOOL CINEMA, which is a unique audio—visual method of learning.To help teachers and parents come together and learn, Facilitators ‘Orientation Programmes and Parents‘ Orientation Programmes are conducted by the school. 80 marks written paper- Annual Exam -Full portion School Assessment for Std. 9 &Full portion board paper for Std 10. Our students not only excel in studies but also in Sports, Literary and Cultural Activities.